Kayakers please note: The cabin on Deserters Island, used by some kayakers, is not in the Conservancy. Before using this cabin please contact the Gwa’Sala-‘Nakwaxda’xw First Nation in Port Hardy for permission, as the cabin is on IR #4 land. The Mahpahkum-Ahkwuna/Deserters-Walker Conservancy is comprised of forested islands, bare rocky islets and wave-wracked reefs in the middle of the northern entrance to Queen Charlotte Strait. As part of the Inside Passage, these waters are one of the busiest marine highways on the coast. The islands also form a series of stepping stones, providing protection for small boaters crossing the strait from Vancouver Island, to access the cruising grounds along the mainland coast. The conservancy was identified for consideration as a protected area during the Central Coast Land and Resource Management Plan planning process. Following Government-to-Government discussions between the Province and First Nations, the central coast land use decisions (February 7, 2006) confirmed that the Deserters and Walker Island groups would become a conservancy. The islands were legally designated as the Mahpahkum-Ahkwuna/Deserters-Walker Conservancy in Spring 2006. The conservancy is located 32 km northwest of Alert Bay, 12 km northeast of Port Hardy and 235 km northwest of Vancouver. The conservancy is within the traditional territory of the Gwa’sala-‘Nakwaxda’xw First Nation. The Mahpahkum-Ahkwuna/Deserters-Walker islands continue to be an area of high importance to First Nations with a number of cultural sites located on the islands and islets within the conservancy. Two small ‘Nakwaxda’xw village sites were once located in areas that are now part of the conservancy. These village sites, and the waters around these islands, were, and continue to be extremely important for seasonal marine harvesting activities. The conservancy’s islands are biologically diverse with nutrient-rich waters that provide an intense feeding area for marine mammals, seabirds, shorebirds and waterfowl. 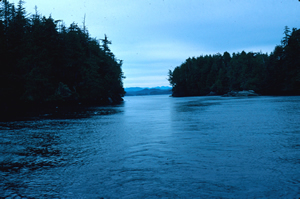 The waters surrounding the islands act as a migratory corridor for several runs of Pacific salmon. The management plan for Mahpahkum-Ahkwuna/Deserters-Walker Conservancy was developed in partnership with the Gwa’sala-‘Nakwaxda’xw First Nation and approved by project partners in March 2013.